NOTE: Crew had no regularly assigned Radio Operator. Kenneth A. Hoeg (P) - Dispatched on 18 missions with three abortions. Last mission on 25 February 1944. Crew then broke up - Reason unknown. Phil W. O'Hare (CP) - Upgraded from CoPilot to Pilot on 29 March 1944 after flying as CoPilot with Lt Hoeg on 16 missions and with several other pilots on seven missions. First mission as Pilot on 19 April 1944. Flew 13 missions as Pilot. Completed combat tour on 24 May 1944. Kenneth L. Olsen (N) - Became a lead Crew Navigator after Lt Hoeg's crew broke up on 25 February 1944. Completed combat tour on 22 June 1944. Ernest L. Cronin (B) - Flew with several other Pilots when the Lt Hoeg crew broke up. Became Lt Phil W. O'Hare's Bombardier when Lt O'Hare was upgraded from CoPilot to Pilot. Flew last mission on 15 May 1944. T/Sgt Ralph A. Relyea (E) - Became Engineer on the Lt George W. Shope Crew when the Lt Hoeg Crew broke up. Combat tour completed on 20 May 1944. 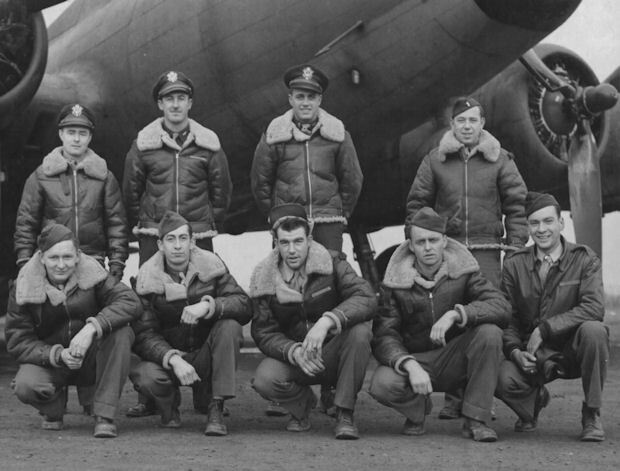 S/Sgt Bonnar R. McMahan (BTG) & S/Sgt Jesse W. McLaughlin (RWG) Flew with other crews when the Lt Hoeg crew broke up. Became a member of the Lt Phil W. O'Hare Crew when Lt O'Hare was upgraded to Pilot. S/Sgt McMahan's combat tour completed on 15 May 1944. S/Sgt McLaughlin's combat tour completed on 8 May 1944. S/Sgt Leonard C. McFall (LWG) - Flew on 9 missions with the Hoeg crew. Last mission on 29 January 1944. Relieved from combat duty for unknown reason. S/Sgt Michael A. Vargas (TG/LWG) - Flew on 13 missions with the Lt Hoeg Crew. Last two missions with other Pilots. With Lt John J. McGarry Crew on 9 April 1944 that crashed after take off at Molesworth. Was thrown from the B-17 during the crash landing and was seriously injured with burns and contusions. Was then relieved from combat duty.